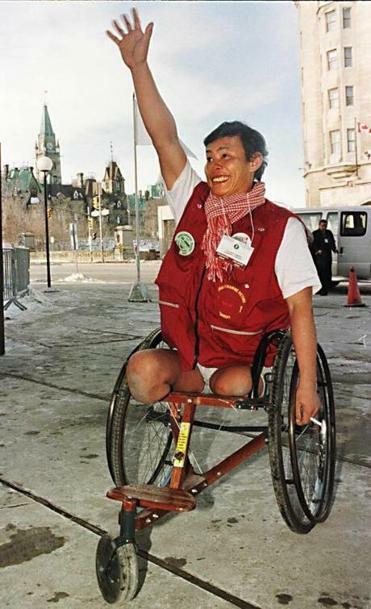 Cambodian landmine victim Tun Channareth waved to supporters following the official signing ceremony of the Global Ban on Landmines Treaty in Ottawa in 1997. In 1997, more than one hundred government delegations and nongovernmental organizations gathered in Ottawa. The occasion was to sign a treaty comprehensively banning the use of land mines against humans — the Mine Ban treaty, as it is known. At the center of this accord, were the tireless efforts by the International Campaign to Ban Landmines, a coalition of civil society groups that would go on to win the Nobel Peace Prize, which worked with a number of like-minded governments to put effective pressure on wavering states to join the process. This innovative form of cooperation began in 1994, and slowly, a division of responsibilities emerged. On one hand, NGOs lent considerable expertise and the appearance of democratic legitimacy to the negotiations — as well as the ability to shame governments. On the other, progressive governments would press key policy issues in the intergovernmental negotiations and eventually use resources at their disposal to convene states to sign the treaty. Eventually, 162 states would become parties to the agreement. The Ottawa process also, however, turned out to be a new model for partnership — one that the United Nations, at age 70, must note. In June, the Commission on Global Security, Justice, and Governance, of which I have been a proud member, presented what its cochairs, former US secretary of state Madeleine Albright and former Nigerian foreign minister Ibrahim Gambari, called “a road map” for the next five years leading up to the 75th anniversary of the UN’s founding in 2020. The commission’s proposed reforms are far-reaching, ranging from UN structural changes for better coping with violent conflict and the impact of climate change on vulnerable populations to mitigating volatile swings in our hyperconnected global economy. Every recommendation, however, will need the support and cooperation of key stakeholders to advance this ambitious agenda. For the UN to remain relevant as a global center for collective security decision-making and conflict management, the commission’s report, “Confronting the Crisis in Global Governance,” calls for, for example, an expansion in Security Council membership and better engagement with nontraditional actors. Specifically, it seeks to create more opportunities for countries, regional organizations, local authorities, and business and civil society groups to contribute to peacemaking, peacekeeping, and peace-building while, at the same time, increasing the council’s representative legitimacy and restraint in the use of the veto, particularly when a state fails in its responsibility to protect its own citizens. Yet equally important is the strategy outlined by the commission that relies on the creative collaboration of state and nonstate actors, or what it calls, “smart coalitions.” As I witnessed the remarkable success of the Mine Ban Treaty as Canada’s foreign minister at the turn of the century, I recognized how important these coalitions can be when seeking to achieve fundamental change to our system of global governance. In the Ottawa process, we saw that it was possible to avoid the lowest common denominator approaches that so often dominate reform negotiations. The normatively strong vision of the project made it possible to resist calls from major powers to water down the treaty text, making it abundantly clear the mine ban was to be comprehensive. Mutually beneficial cooperation was essential from the start, along with a clearly defined, pronounced commitment to the human security principle for the protection of people. It proved an approach that would later be applied to campaigns for the International Criminal Court, the protocol on child soldiers, and a treaty banning cluster munitions. Now, this is the only path forward for achieving true governance reform at the United Nations. That is why these coalitions are the heart of our commission’s reform strategy. For example, we propose establishing a UN Global Partnership with the mandate to strengthen the involvement of civil society actors and business in all aspects of UN work. It also throws its support behind the two-decades-old campaign led by civil society groups to have the Security Council enforce International Criminal Court judgments and arrest warrants. We also back the goals of the 1-for-7 billion campaign calling for an open and inclusive process to select the UN’s secretary-general as well as the effort to establish a UN Parliamentary Assembly, aimed at reducing the world body’s democratic deficit. Both are driven by nongovernmental actors. Likewise, the proposal for a Peace-building Council could substantially improve UN practices, such as the use of new technologies and more focus on prevention as a way to ease the impact of conflict. Finally, the commission urges non- or sub-state actors to move beyond the complex intergovernmental climate negotiations in the run-up to December’s Paris Conference. Specifically, such actors, in their increasingly important role, should home in on signing their own agreements and making pledges at the provincial, municipality, or business-sector levels. Many global governance problems and threats are too serious today to leave them to national governments alone to solve. Indeed, the past year has shown that many of the world’s biggest challenges today — whether it is mass violence in fragile states, runaway climate change, global migration, or fears of devastating cross-border financial shocks — outmatch the capabilities of any one state, regional organization, or even the United Nations to address alone. Deep and skillful cooperation is essential, and the commission invites partners from across the globe to contribute in the pursuit of a vision of justice and security for all. Lloyd Axworthy was the Canadian foreign minister from 1995 to 2000.